Hi we just installed CU3 update in our SharePoint server https://www.microsoft.com/en-us/download/details.aspx?id=50043 then after restarting the machine the Workflow Manager Backend cannot be started. The Workflow Manager backend failed to start at location 'WorkflowServiceBackendHost.OnServiceStarted' due to an exception: System.InvalidOperationException: The current version of the Workflow Resource Management Store, 1.0.2.0, is older than the running product which is designed for the Workflow Resource Management Store version 1.3.0.0. Please upgrade the Workflow Resource Management Store. Is there anything that we need to check to fix this issue? This issue occurs because of the Workflow Resource Management Store version value at [WFResourceManagementDB].[dbo]. [StoreVersionTable] is still 1.0.2.0 despite you have installed CU3 that should work with Workflow Resource Management Store version 1.3.0.0. Now the the Workflow Resource Management Store version value at [WFResourceManagementDB].[dbo]. [StoreVersionTable] should be 1.3.0.0 , the workflow manger backend should be started. Have a look at the steps in the post at https://blogs.msdn.microsoft.com - while this refers to an earlier version of Workflow Manager, the issue described is exactly the same as yours and the steps to resolve look like they should work for your scenario. Essentially, you need to manually run the upgrade scripts WorkflowServiceInstanceManagementDBUpgradeScript and WorkflowServiceResourceManagementDBUpgradeScriptsql located in the Workflow Manager install path\1.0\Workflow. These Scripts are shipped as part of the cumulative update for Workflow Manager. Run the scripts manually on any node of the Workflow Manager farm and then check whether everything fires back up. 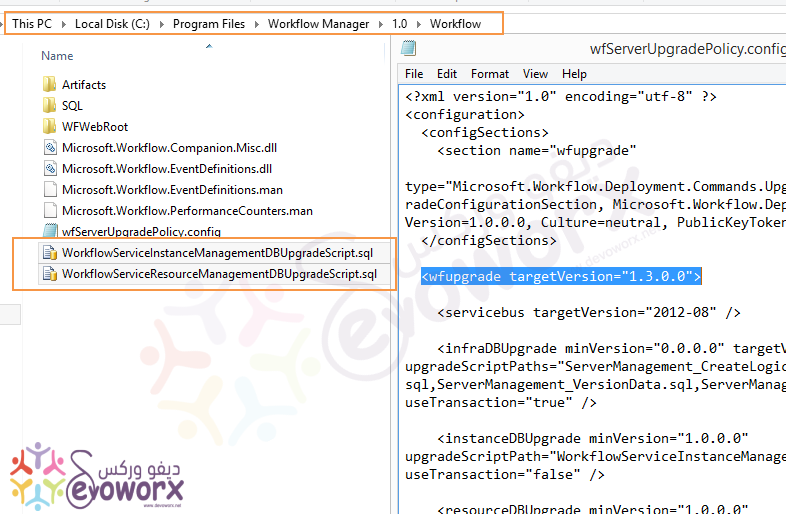 The workflow manager installation cant execute the script in our WorkflowInstance and ResourceManagement DB. So what i did is to execute the 2 scripts in the databases and the workflow service backend start to run again. Not the answer you're looking for? Browse other questions tagged 2013 workflow server-farm workflow-manager workflow2013 or ask your own question.